A fun section to peruse on The Digital Story is our Product Reviews page. There you can learn about interesting cameras, useful accessories, and the latest software to help you get more out of your photography. 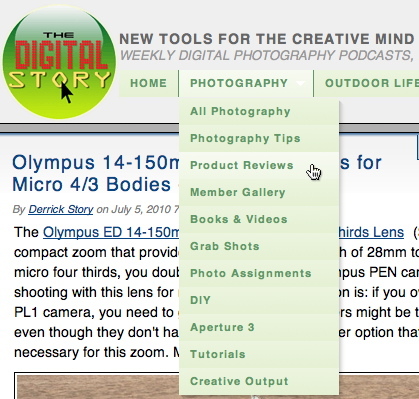 The easiest way to get there is to mouse over the Photography tab in the top navigation bar on The Digital Story. Product Reviews are the third item down. And don't forget, we have full search capabilities too. Just type in what you're looking for in the search box in the upper right corner, and the results will be delivered right away. Thanks Derek. Great to have all this information in one place. I'm looking for a new camera to replace my 'old' Canon 20D. I'll be trawling through this over the coming weeks. You have some interesting options, Roderick. If your budget allows, I would look at the 7D. It is a well built, highly specified camera that would feel great for a 20D owner. Of course, e T2i is a great camera too for less money. But it might feel too light after using the 20D all this time.